Extensive pictorial anthology chronicles the extraordinary career of the man who changed aviation history. 250+ rare photographs, accompanied with detailed captions, depict Lindbergh in his childhood, to his "barnstorming" days, to the young pilot examining damage to his Curtiss JN-4 "Jenny" after crashing it in 1923, to touring with the plane that made him famous, the Spirit of St. Louis. 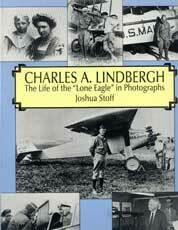 Charles A. Lindbergh, The Life of the “Lone Eagle” book: 165 pgs, softbound, 9 x 12, 273 b&w photos.